Bred at the Agriculture Canada Research Station in Fredericton, New Brunswick, from the cross (Belleisle x N457). 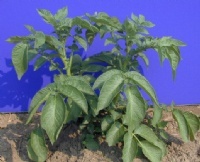 Released in 1988.
medium, spreading growth; medium thick stems; inconspicuous wings, nodes not prominent. 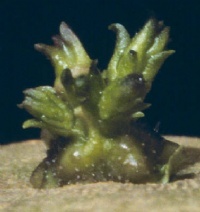 medium green, open, sparse pubescence on upper surface. Terminal leaflets: ovate, tip acuminate, obtuse to truncate base, usually symmetrical. 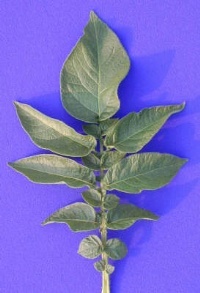 Primary leaflets: four pairs, narrowly ovate, tip acute, base somewhat asymmetrical. 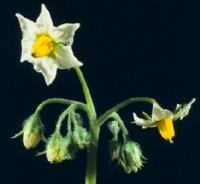 medium size white corolla, petals are separated at the base (hole); orange anthers. round to oval, slightly blocky; smooth buff coloured skin; moderately shallow eyes; white flesh. spherical, small, no colouration or pubescence. 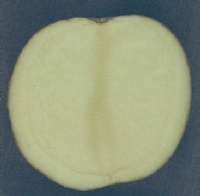 Medium to high yielding variety; not susceptible to hollow hart. Medium specific gravity. Medium dormancy. good to excellent quality for boiling and baking. 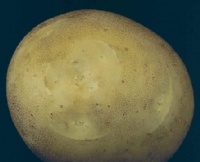 PVY, tuber symptoms of early blight. common scab, PVS, Verticillium albo-atrum witl, phoma tuber rot. leaf roll, Verticillium dahliae wilt, blackleg, rhizoctonia, late blight, foliar symptoms of early blight, fusarium dry rots.